Tomorrow, my bloggy/work friend Thomas will be in town for some training at work. He'll be here until Thursday when he goes back home. We've only met in person once, and he's never been to Lynchburg, so I'm looking forward to giving him a nice tour of the town and take him out to eat at a few places. 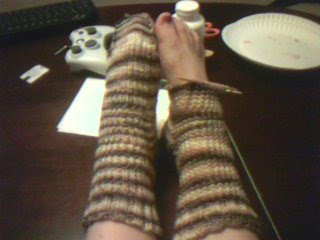 Also, almost done with my second sock. Woot! Your socks are looking excellent! I, too, had to be talked into doing them, so I can relate to your excitement. I hope you and Thomas have fun. Look at you go on those socks! I always frog every sock I have ever made, which isn't that many really but I get almost done and I see holes or my count is off and I get frustrated, set it aside then come back and rip it up. LOL Seriously though, this weekend I noticed I was knitting in the wrong direction and I have no idea when that happened! It's crazy I tell ya. That one sock has a hole in it...huge one. You are doing incredible with your socks..enjoy your visit with Thomas..Bring him to Bedford and show him The D-Day Memorial..that's intersting!